The theme of the 69th Pepperdine Bible Lectures, “Living Between the Times,” proved to be an apt theme for a year of transition for the lectures, which were held on the Malibu campus from May 1 to 4. While the mainstays of the annual tradition remained intact, from stimulating classes to spirited musical performances, 2012 will stand out in Bible Lectures history as director Jerry Rushford’s final year of leadership after 30 years. Rushford marked the occasion by closing the lectures on Friday evening with a keynote address, titled “The Wondrous Story,” an occasion for which president Andrew K. Benton secured the historically-significant preaching podium of Alexander Campbell, one of the founders of the Stone-Campbell Restoration Movement. Incoming Bible Lectures director Mike Cope also marked the transition by presenting the opening remarks on Tuesday, before Pepperdine’s musical tradition, Songfest, welcomed attendees in a lively fashion. Additionally, the Associated Women for Pepperdine continued their annual tradition of serving pie and coffee each evening, raising money towards student scholarships. Pepperdine Libraries hosted two special events during the Bible Lectures in Payson Library. An open house at the Churches of Christ Heritage Center, founded by Rushford in 2009, showcased the center’s repository of archival materials, while an exhibit titled, “A Window into Our Past: The Lives of Remarkable Church Leaders,” featured memorabilia from the Special Collections and University Archives, highlighting the lives of several influential members of Churches of Christ, including Norvel and Helen Young, George and Helen Pepperdine, and J. M. McCaleb. Moving forward, Rushford, who began his post as director in 1983, continues to oversee the work of the Churches of Christ Heritage Center. Through the gracious support of 185 donors contributing nearly $120,000, Pepperdine has established the Jerry Rushford Center for Research on Churches of Christ and the Stone-Campbell Restoration Movement, for which Rushford will host lecture programs and produce publications. 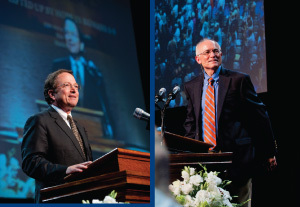 "It has been a unique and humbling privilege to preside over the Pepperdine Bible Lectures for 30 years—one entire generation," says Rushford. "I am now looking forward to creating a research center that will encourage research on the history of Churches of Christ and the Stone-Campbell Restoration Movement." Donate to the Rushford Center Fund or learn about the 2013 Bible Lectures on the Bible Lectures website.